As the Governor of 1 of the 4 prisons to first test the use of PAVA spray, I’ve seen how it works first hand. But before the trial started, I was unsure how it would work. When I first heard that PAVA was going to be trialled I didn’t think there was a need for it, and I thought it could clash with our rehabilitation culture. But when I saw how PAVA was being used during the trial, I feel very positive. One of the most important factors behind the trial’s success was giving thorough training to all staff using PAVA. PAVA is a synthetic pepper spray, so it has the potential to stop a violent prisoner in his tracks or prevent themselves from hurting himself, others, or staff. Your training is designed to ensure you know how to use PAVA accurately in any serious threats of violence. Another important factor to the successful use of PAVA is having strong systems in place to make sure it’s only used to manage situations where staff have concerns for their safety. We only want it to be used when it’s really necessary, and we don’t want it to replace staff using their interpersonal skills to de-escalate and manage situations. That’s why it’s essential from a governor’s point of view that you have the right systems in place to ensure PAVA is only used appropriately. PAVA will be fully rolled out in April 2019, to provide staff with enough time to be properly trained. You should never under-estimate the importance of talking to a prisoner to de-escalate a situation. However, there are times when a prison officer may have to use Control and Restraint techniques or draw their baton to bring order and control back in a prison. However, you need to actually get up close to use a baton. 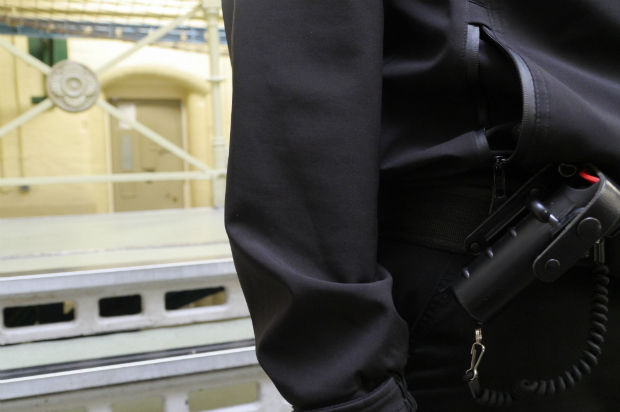 But with PAVA, a prison officer can use it from a distance and there’s a much lower risk of injury, giving staff more confidence in being able to deal with a situation. I believe PAVA has prevented serious injuries to staff and prisoners. When used properly, it helps staff control serious incidents without further harm. For us, there’s no doubt that we’re dealing with a difficult population, so PAVA has been a really useful safety tool. Read more about the roll-out of PAVA to prison officers across the country. Thanks for your comment. All prison officers who'll be equipped with the spray will be thoroughly trained before they use it. when will the officers at pentonville prison first have the spray on them? Thanks for your query - as blog moderators we don't know dates for specific prisons but the PAVA roll-out will start early next year, giving time for essential training to take place first. will the pava spray training occur during the 10 week poelt training? Thanks for your query. The PAVA spray training is not currently part of the POELT. This could change in the future, but prison officers are currently being trained in their establishments (prisons) from now. Will you be publishing the report of the six month trial? Thanks for your query, and apologies for the delay in our response. The outcome of the report was used to help inform our policy on the roll-out of the PAVA spray, but there are no plans to publish it. Hi there, will officer be given rigid bar handcuffs and training with them at the same time as paca spray? As it was announced we were going to get rigid cuffs in 2017 but still haven’t received training or the piece of equipment yet? Sorry for the delay, I’m afraid as blog moderators we don’t have access to this information. Perhaps you could speak to your mentor or direct line manager?